So far we've identified three accounting implementations: Method C (cash only reports), Method A (stand-alone accrual accounting) and Method B (a"hybrid" of cash accounting and integrated production records). Your accounting staff is already preparing real-time accrual financial statements and are looking for an automated way to update those statements from internal business activities. You want to move beyond simple enterprise analysis to tighter reporting and control of you major business segments (farms, fields, animal groups, and support centers like equipment, facilities and activities). What Does Method ABC look like? 1. Integration with production information. If you're tracking field or livestock performance records, the direct and indirect costs will come through your accounting records. 2. Cash and/or accrual accounting. You can continue reporting taxes on a cash basis but also produce accrual financial statements. 3. Real-time cost-basis inventories. Both accounting and production events will drive inventories. Inputs like seed, chemicals, fertilizer and feed and growing/harvested crops and growing animals will be valued at actual cost. 4. Tight accounting tie-out between physical activities and financial statements. All raw material, work in process and finished goods inventories flow through the balance sheet and income statement without losing management detail, permitting "slice and dice" analysis at any level and any point in time. What are the benefits of Method ABC? 1. Accounting control of your business at the same level as you manage: by commodity, production year, farm, field, group or support activity. Other alternatives may "plug" costs into livestock closeouts or field reports but performance doesn't feed back into accounting and accounting doesn't drive all costs down to the field or group. 2. Provides controllers, auditors and lenders an interlocking detailed audit trail that emulates accounting principles followed by the manufacturing world and the Farm Financial Standards Council. 3. Can continue to record most accounting transactions as expenses or revenues with the accrual inventory and expense adjustments occurring automatically"behind the scenes." 4. Doesn't require that production employees allocate costs or accounting employees perform manual work-in-process adjustments. What are the downsides of Method ABC? 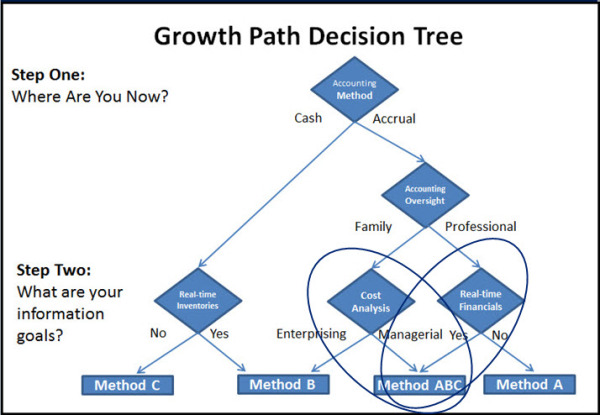 While a "mountain top accounting experience," Method ABC is definitely not for everyone. 1. System cost. There's an up-front cost to knowing your costs. Specialized vertical market software always costs more than generic accounting software. 2. Learning curve. If your current practice is do-it-yourself Method C or accountant-generated Method A, adopting Method ABC will require a more structured view of your business. FBS provides training and consulting in this field following the Farm Financial Standards Council Management Accounting Guidelines. 3. Staff and professional involvement. You don't have to have a full-time controller to take advantage of Method ABC but you may need to collaborate with trusted professionals like the ones you'll find on the Partners page of our website. 4. Requires a company culture that values and uses information. If you're an accounting "lumper" rather than a "splitter," are having trouble collecting data from employees or view accounting as nothing more than a "necessary evil" for the banker or IRS, then you're not ready for Method ABC. For a free webinar explaining how Method ABC works, contact FBS at sales@fbssystems.com or 800.437.7638 /Ext 2.